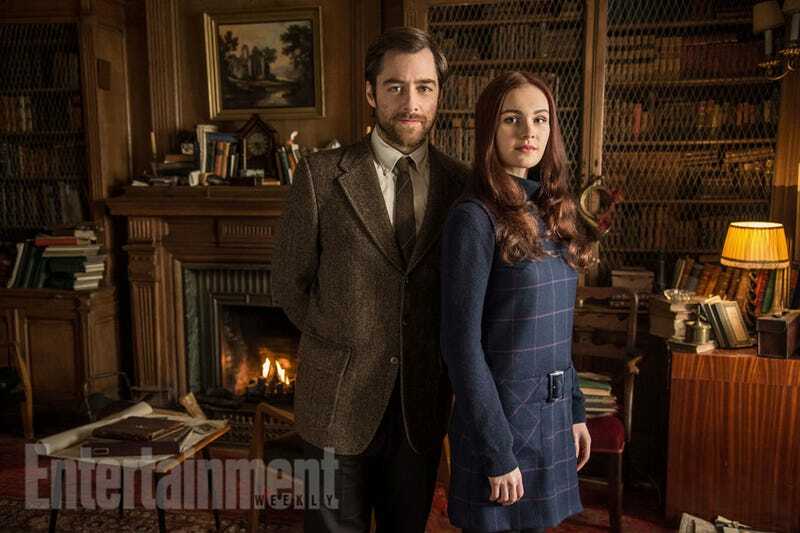 There has been a crazy amount of secrecy surrounding the debut of the adult versions of Brianna Randall (Sophie Skelton) and Roger Wakefield (Richard Rankin) on Outlander. And now, thanks to Entertainment Weekly, we’ve finally got a picture. We won’t see these two until the season two finale, “Dragonfly in Amber,” but book fans know how important they are. Brianna is Jamie and Claire’s daughter, conceived in the 1740s, raised in the 1940s by her mother and her mother’s first/future/past husband, Frank. Time travel makes tenses and ordinal numbers hard. It’s a safe bet, based on the first two seasons, that the next season of Outlander will cover Voyager, the third book in the Outlander series and one where Brianna and Roger play a significant role. The further on this series goes and the more books they cover, the more important Brianna and Roger become. It’s that kind of scrutiny which probably led the show’s producers to hide details of these two for so long. Sophie Skelton even tells Entertainment Weekly that the buildup is scary because they have made some choices that deviate from the book. Brianna has no Boston accent in the show because “We just assumed that given how she was raised in a private Catholic school in the ’60s, she sort of had any Boston drummed out of her and she’d be a standard American.” And Skelton doesn’t have the blue eyes the book character does. All of which is superficial stuff. We still have to wait for the actual finale to make any informed judgments about these two.